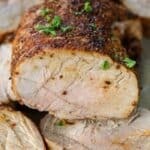 This low carb pork tenderloin comes out juicy and perfectly cooked every time. A simple southwest seasoning is all you need to elevate the tenderloin and create a low carb dinner for the whole family! 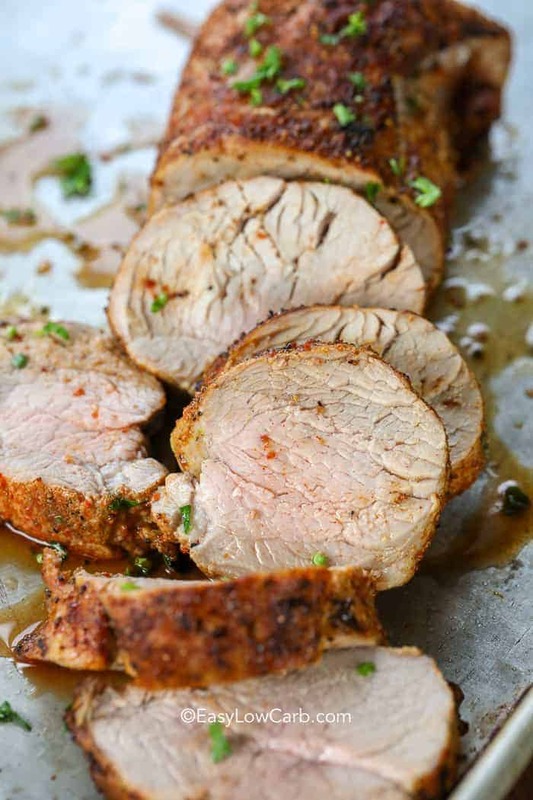 Serve this low carb pork tenderloin alongside some roasted radishes and rosemary mushrooms for a satisfying dinner for any night of the week! Step up your culinary game and make room for this succulent, tender and tasty roast pork tenderloin! 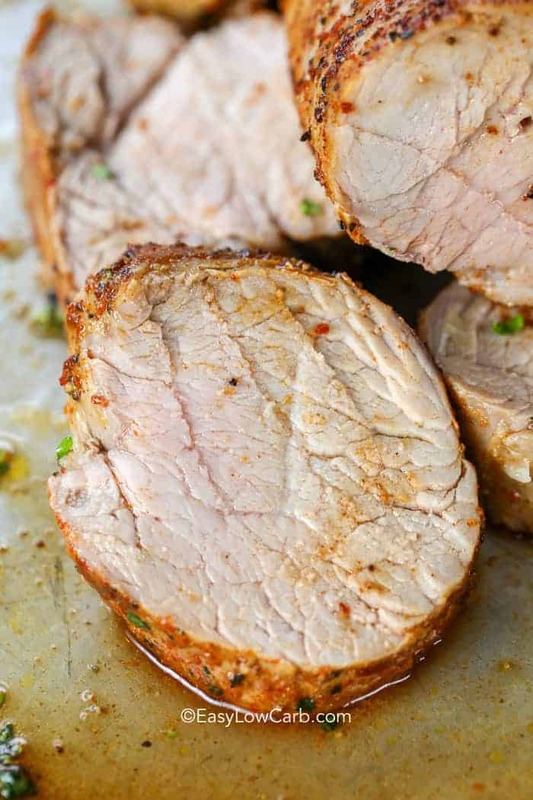 This is one of the easiest, fastest and most impressive pork recipes out there! 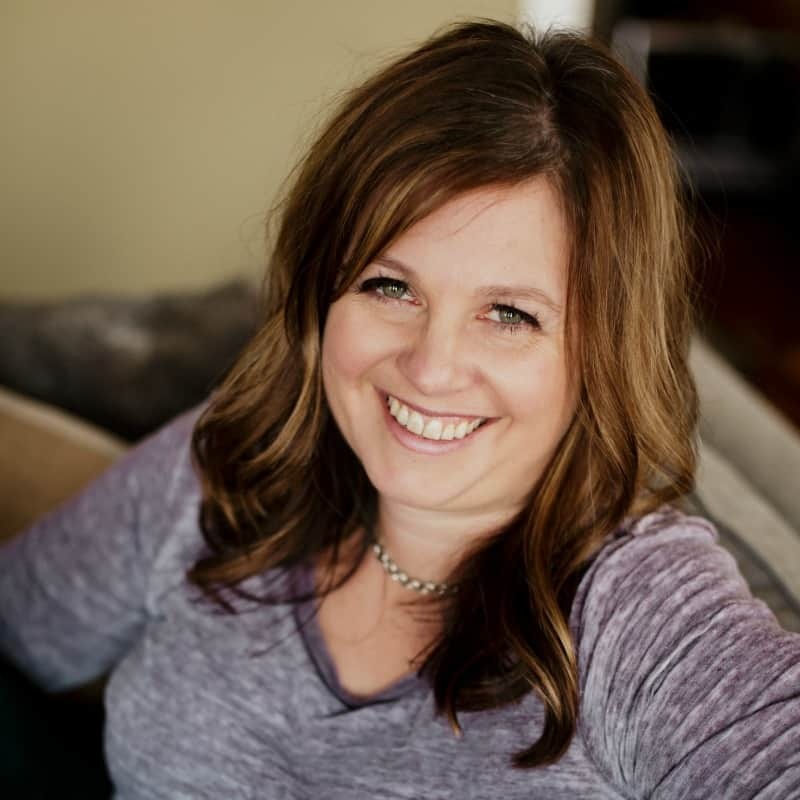 All it takes are a few simple ingredients, some basic tools and a little know how! Because of its beautiful appearance when it comes out of the oven, roasted or baked pork tenderloins are popular restaurant menu fare, especially when served with a flavorful mushroom or cream sauce. But now even the humblest home chef can recreate a mouth-watering version at home! This pork loin is more than an every day dinner option, it makes for an elegant and delicious holiday entrée too! The key to a tender pork is to get the perfect pork tenderloin temperature. It’s easy if you have a meat thermometer and know how to use it. 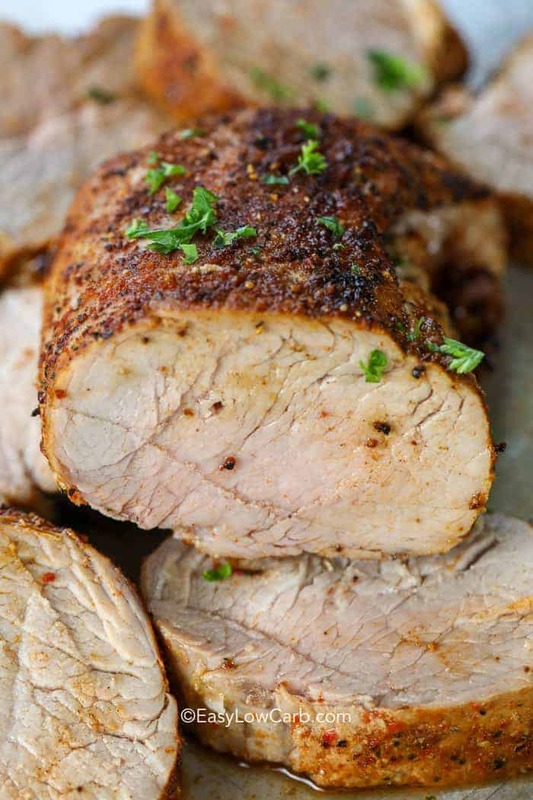 For the best roasted pork tenderloin, just a few savory herbs and seasonings should be used. A simple southwest seasoning is all you need to bring out the mellow flavor of pork! Because of the thin layer of fat that covers the pork tenderloin, there is no need to add very much additional oil. Simply score the top of the fat cap in a criss-cross fashion and rub the seasonings in for a slightly crunchy topping. And that’s basically it! Roast your tenderloin a full 25 minutes per pound at 425°F, making sure the loin reaches an internal temperature of 145°F to 160°F. Forget about the tired old side dishes like applesauce. Try wrapping your pork tenderloin in bacon or serving with baby russet potatoes and carrots for a one-pot meal that is sure to impress! Unlike the tenderloin, a pork loin weighs in about 4 pounds and will require a longer cooking time, especially if vegetables or other liquids are added. Other items in the pan will add to the flavor of the finished product, but will also add cooking time. So be sure to take that into account! Either way, the best way to make sure your pork loin roast recipe is successful is to check the temperature every 20 minutes or so, being sure to check in different places on the roast for accuracy. Whether you are roasting a tenderloin or the larger pork loin, pull the roast out when the internal temps reach around 150°F and then let it set for 5 to 10 minutes. As the roast cools, the juices will be sealed in, creating a juicy, flavorful entrée that will have your guests coming back for more! Remember to create a savory sauce by reducing with broth or simmering with cream and butter for a creamy sauce. A few sautéed mushrooms, shallots, and a sprig of rosemary or thyme and dinner is served! Line a pan with foil. Rub tenderloin with oil and sprinkle generously with seasoning. Roast pork until temperature reaches 145°F using a meat thermometer (about 18-20 minutes). Remove from oven and rest 5-10 minutes before slicing. Hi Barbara, a regular baking pan will work.